The Kool-Mart is a 20' wide, budget-friendly structure featuring integrated display benching and heavy-duty construction. Designed for quick and easy setup, the Kool-Mart provides lots of built-in display space for your fast-selling annuals and hanging baskets. Two large door openings provide plenty of ventilation while giving your customers easy cart access on both ends. Whether you are just starting out or are an established business looking for an economical seasonal addition to your garden center, the Kool-Mart is the no-nonsense greenhouse for you. Includes the standard bench tops shown to the left. Integrated display benching - The Kool-Mart contains built-in side and center benching to display your product in the best possible way. These high capacity, built-in displays provide more benching area than standard block & plank. Two roll-up end doors - Wide, ten-foot openings on each end allow easy access to the Kool-Mart for your customers and carts. Durable, 3-ply, reinforced polyethylene roll-up doors open up and shut down easily and quickly. 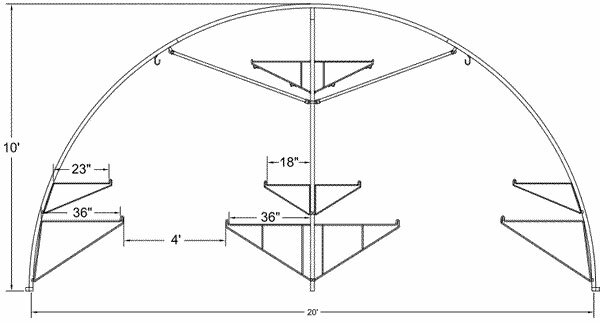 Hanging basket purlins - The Kool-Mart features six hanging basket purlins. Four are above the center benching and another two run the full length above the outside benching. Roof and end wall poly - A choice of clear or white 6 mil. roof polyethylene with clear poly on the end walls. Our poly coverings are UV stabilized, and come with a four-year limited warranty. Wiggle Wire poly attachment system - Used on thousands of greenhouses, Wiggle Wire has proven to be a low-cost, effective system to attach polyethylene or shade material to greenhouses. Quick and easy to use, the Wiggle Wire attachment system requires no tools. Hold down system - Easy-to-install ground spikes secure the Kool-Mart to the ground.